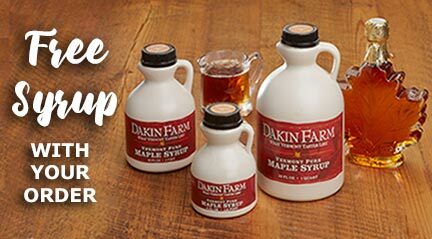 Get a FREE jug of our famous Maple Syrup for orders over $50.00! If your order is over $50.00 you will receive a FREE 1/2 pint of our Vermont Maple Syrup. If your order is over $100.00 you will receive a FREE Pint of our Vermont Maple Syrup. No code is needed. Free Gift will be offered automatically for qualifying purchases. Excludes shipping charges and cannot be combined with other offers. Not valid with purchase of gift cards or e-gift cards. Valid online and over the phone only. Not valid in our two retail stores.